Another of my favorite “comfort meals” is Tomato Soup with Grilled Cheese…but have you looked at the ingredients for your favorite canned soup recently? SO i had to figure out how to make this myself! In place of the grilled cheese I also made Grain Free Cheddar Bay Biscuits!! Pre-heat oven to 400 degrees and line cookie sheet with parchment paper. Cut each tomato into 8 equal parts and place them on the parchment paper, skin side down. 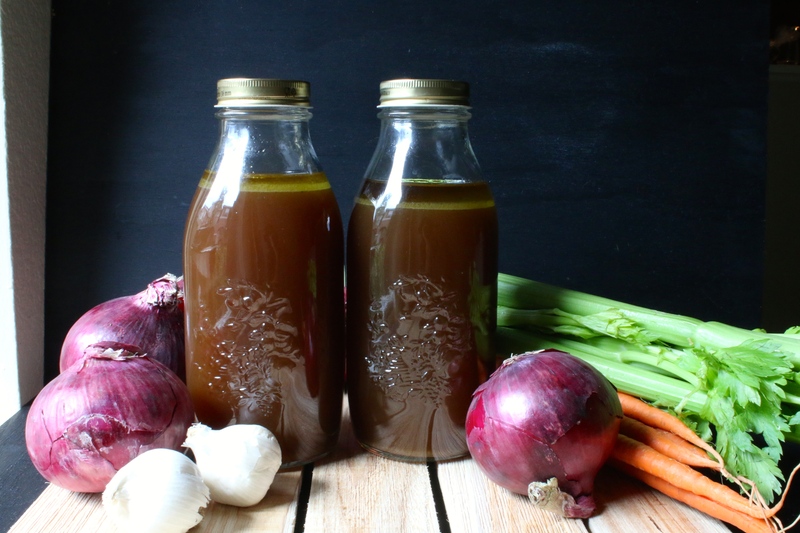 Transfer roasted vegetables with roasting juices to a large sauce pan and add vegetable broth, thyme & bay leaf. Simmer for 20 min. 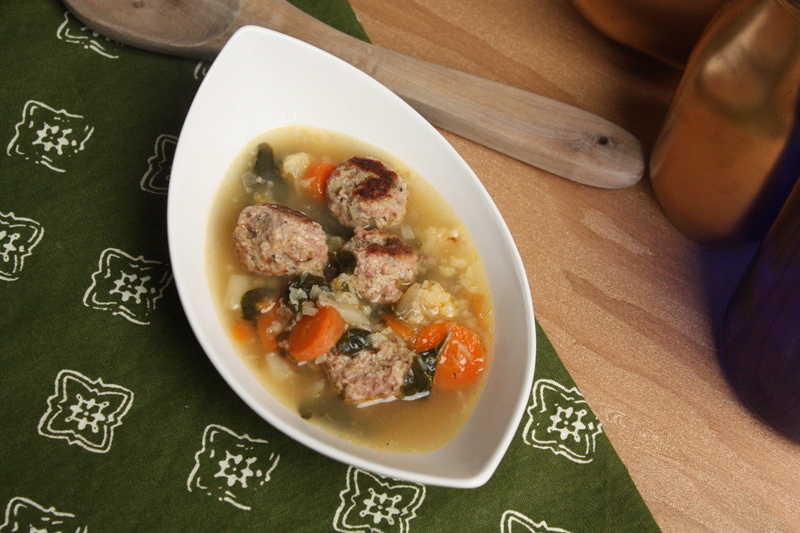 Remove thyme and bay leaf…puree the soup. 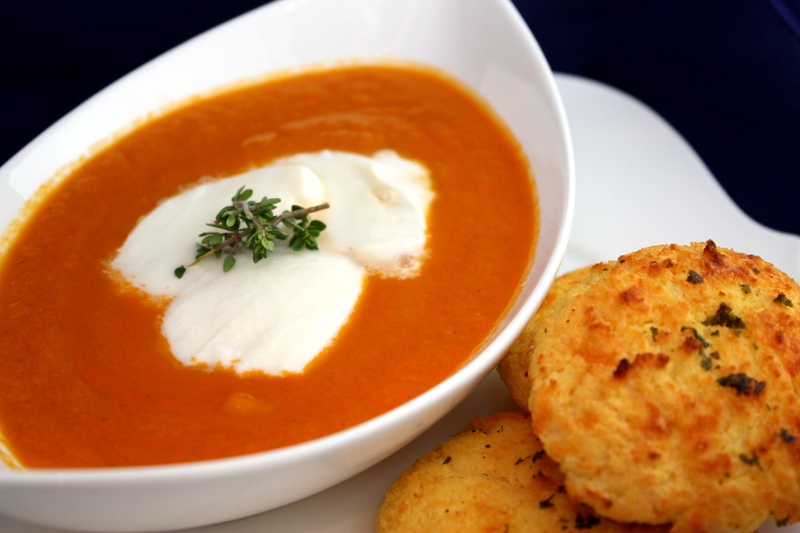 Serve the soup & add mozzarella on top…enjoy! In a medium bowl, mix dry ingredients. Then add remaining ingredients and mix with a wooden spoon or spatula until well blended. Use scoop to scoop out dough onto un-greased cookie sheet lined with parchment paper (or not, see notes above). Space 2-3 inches a part. Bake for 13-15 minutes for small biscuits and 20 minutes for medium biscuits. Once out of oven, smear a bit of salted butter and sprinkle with a little parsley. Best served warm. 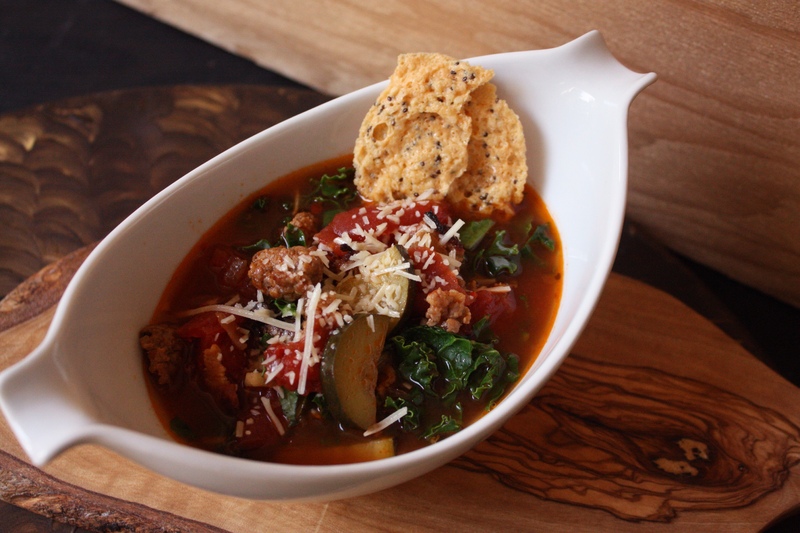 I am always looking for a good soup and this one is a winner! 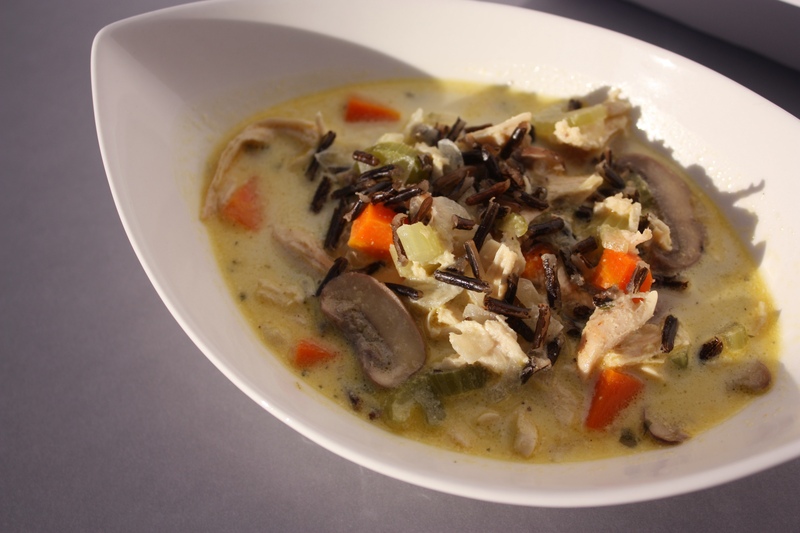 I had not worked with Wild Rice before this and I was pleasantly surprised…it’s a fantastic “add” to any soup. Melt butter in a large saucepan over medium heat. Stir in onion, celery,& carrots; sauté for 5 min. Then add mushrooms, sauté for 2 more minutes. Add the rice, chicken, salt, curry powder, mustard powder, parsley, ground pepper, and sherry. Allow it to heat thru, then pour in cream. 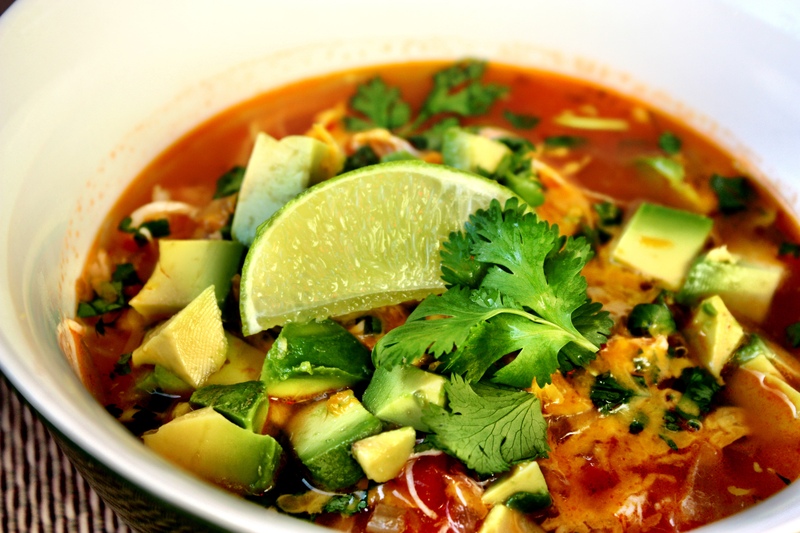 I LOVE my old recipe of Chicken Tortilla Soup…BUT it’s full of things I don’t eat anymore, SO I am really excited that this taste delicious!!! I usually make a double batch and freeze half of it. Add the chicken breast, chicken broth, canned tomatoes with chilies, oregano, and cumin to the pot. Bring the whole pot up to a boil over high heat then reduce the heat to low, place a lid on top, and let simmer for one hour.